Cale's Notes: Updates and changes. Get To Know Your Company... And its real profits. Ask the Geek: Why is that cash there? About the Tarpon Folio: More about our Spoke Fund®. To change your subscription, see link at end of email. I made more changes to the Tarpon Folio in September, as described below. But first, an update on our investor meeting, more on a special article included in this letter, and then a note on changing fees and account minimums. Plans for our investor meeting on January 30th continue to move ahead. I'm pleased to announce that we will be joined at our meeting by Ken Peak, the CEO of Contango Oil & Gas. You may recall that I wrote about Ken and Contango in my March letter. Ken will be coming to the meeting to update us on the many things going on at Contango and answer any questions you have. He is a world-class operator and I think you'll really enjoy meeting him. I understand that airline tickets are cheap right now, so book 'em as you see fit for the meeting. Some of the most impressive oceanfront resorts in town include the soon-to-re-open Cheeca Lodge, Casa Morada, The Moorings, Chesapeake Resort and The Islander. Give me a call if you want other lodging ideas, too. I'll be posting more details about the meeting in the next few letters and on my blog under the "Annual Meeting" category. Rather than the usual "Get To Know Your Company" section in this letter, I've included an article I wrote discussing the valuation of the broader market. I'm getting the sense that many investors are feeling pressured by the financial media and various pundits to get back into the market now to avoid missing this continuing rally. Unfortunately, one of the reasons often cited as jusification for rushing back in - "the market is still cheap" - does not hold up under closer scrutiny. As I discuss in the article, commentators making that conclusion based on "operating earnings" and not real reported profits are doing individual investors a huge disservice. Read on to learn more. And a special thanks to Kirk Kinder of the fee-only firm Picket Fence Financial who had the idea for the article to begin with. You may soon see an expanded version of the article including additional thoughts from Kirk floating around the internet. Lastly, a word on fees. I'll be raising both our fees and our account minimums for new investors in the Tarpon and Gecko Folios on January 1, 2010. All indications are that we'll have an amazing year for both portfolios in 2009, and now that we've got something to talk about, it's time to start really growing this business in 2010. Not to worry, though, if you're currently an investor. Anyone invested prior to January 1st will be grandfathered, so your fees will stay at the same 0.90% per year for life - even on additional future contributions you make to your account. And if you're not currently an investor with us, but would like to learn more, please drop me a line. Until January 1st, I will continue to waive our management fee for one quarter for new investors, too. 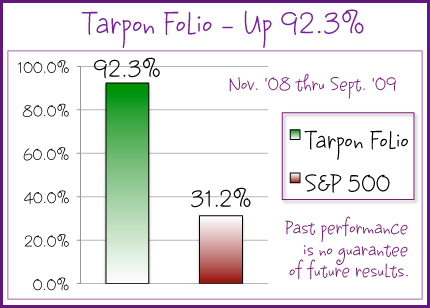 The Tarpon Folio increased by 7.0% during September compared to an increase of 3.6% in the S&P 500. Since inception last November, the Tarpon Folio is up 92.3% through the end of September, and is outperforming the S&P 500 over the same period by 61.1%. Since I last wrote, I have sold all of our holdings in Blackbaud. Like the two companies I sold last month, Blackbaud shares increased uncomfortably far beyond what I think they're currently worth. The company's flagship Raiser's Edge software will likely continue to dominate the nonprofit market, and should the stock decline precipitously in the future, we could conceivably own shares again. For now, though, there are better opportunities for us to realize larger gains over the next few years. The sale of those shares increased the cash we held in Tarpon to about 30% of our portfolio at one point during the month. While I have since started putting much of that cash to work in new companies, I admit I was surprised that we outperformed the market again in September despite having a large percentage of the fund in cash, earning nothing. Fortunately, CarMax put up impressive numbers in its second quarter results, causing shares to jump, and I sold Blackbaud at the apex of its 52-week high. Sometimes it's better to be lucky than good. I have been investing our money in several new companies. I'm finding value in telecommunications companies, which as a sector lagged the broader market in this year's rally. I'm particularly impressed with the moat around the business of Neutral Tandem, an oddly-named company with some serious network effects. The company has solved an epically dysfunctional aspect of telecommunications that I first became aware of long ago when I used to provision ciruits at an internet service provider. Shares had recently sold off due to a fundamental misunderstanding about the business, and I believe our timing will be fortuitous. More about Neutral Tandem soon. While good cheap moats are harder to find these days, I'm also pleased to be adding Compass Minerals to the portfolio. Like our other additions, recent bad news - in this case a weak near-term outlook for corn prices - has made shares attractive. You might be surprised at how impressive a business can be built by selling rocksalt and fertilizer. So if your eyes glazed over when you read "telecommunications" above, not to worry. Compass is another simple, boring, but wonderfully advantaged business that I'll be discussing in more detail before too long. I'm also pleased with the other companies we have begun to nibble at in the portfolio, and will pass on more info about each once we've reached the position sizes I have in mind. Several of those companies' shares began to increase in price before I could take full advantage of lower prices, which annoys me to no end. But, I suspect we'll see some better prices again before too long if this year's volatility continues. In the meantime, I'm happy to wait. So, there will be more changes to Tarpon to discuss in next month's letter. While October could be a volatile month in the market, I intend to tune out the noise as usual, except when we can take full advantage of it. In the interim, a special article I wrote follows which may help frame some of the things you may be hearing about this continued market rally. Most investors probably would not think that something as straightforward as the definition of a company's earnings could be controversial. Welcome to Wall Street, where obfuscation is intentional, clarity is rare and earnings are not always earnings. Publicly traded companies in the U.S. are required to publish their financial results in accordance with generally accepted accounting principles, or GAAP. A company's profit under GAAP rules is considered to be "reported earnings." However, many companies emphasize a different version of earnings to their investors. Management teams often refer to "operating earnings" under the pretense of better capturing the underlying trends in their businesses. That idea makes sense when intentions are sincere. Referring to operating earnings in lieu of true reported earnings isn't necessarily a bad thing, as the GAAP definition of earnings does include some slop. More specifically, GAAP earnings can include items such as write-offs, gains on asset sales, restructuring charges and goodwill write-downs that are one-time events with no bearing on the company's core operational results. So when it comes to gauging a company's true progress, GAAP earnings aren't perfect. The problem with relying on adjusted operating earnings, however, is that they can be seriously misleading. There is no industry standard that defines the term. Management teams can literally exclude whatever they'd like to in the operating earnings figures they publish. An overemphasis on operating earnings, sometime called "Street earnings," "core earnings," or "pro-forma earnings" is not new. Analysts usually exclude items that are not part of a company's normal operations in analyzing the businesses they follow. Since the early 1990's companies have often emphasized operating earnings over reported earnings to their investors. What is new, however, is that the operating earnings of many public companies now appear to be either excluding items that they should not be or that are not really non-recurring – to a historic degree. In other words, companies are claiming things that happen routinely are one-time events in order to prop up the earnings figures they highlight to their investors. Lately, many individual investors have felt pressure to get back into the market out of fear they will miss out on further gains. Much of that motivation is fueled by pundits and talking heads insisting that "the market is still cheap based on historical earnings." Investors should understand that while the market as a whole may be attractively priced based on operating earnings, it's a far different picture when looking at companies' true earnings. The difference between true earnings and operating earnings has never been bigger than it is right now. Standard & Poor's recently reported that GAAP earnings per share for the 500 biggest public companies is $7.21 per share, while operating earnings are $61.20. That $54 gap is an all-time record. Why does it exist? Much of it can be explained by huge write-downs in the financial sector in addition to a high degree of write-offs in other industries address as more companies deal with their own impaired assets, too. Job cuts and declining production explains more of the gap. But to be clear, some companies appear to be abusing the notion of operating earnings, too. Take the case of Alliance Data Systems, a Texas company that manages customer loyalty programs and provides private label credit cards. You'll notice in the subheading of its most recent quarterly earnings release that the company highlights "cash earnings per share" and not GAAP earnings. How does Alliance define cash earnings? By taking GAAP earnings and adding back certain expenses, including the cost of stock compensation given to management and employees. It also adds back a chunk of the premiums it pays to acquire credit card portfolios and customer lists. While GAAP considers such premiums the cost of doing business, Alliance considers them an intangible asset – meaning it can amortize them. And because Alliance adds back amortization expenses to get to its touted "cash earnings," the earnings figure the company is highlighting grows larger - despite the fact that it is an expense that actually reduces profit. Alliance's "cash earnings" for the second quarter were 95 cents a share, but GAAP earnings in the period were 51 cents a share. The gap between the two figures was even wider in the first quarter, when Alliance reported "cash" earnings of $1.19 a share compared with GAAP earnings of 45 cents. Only on Wall Street can a company take expenses, add them back to profits, point to that number as the primary indicator of serious business progress, and then see its shares hit a 52-week high. And would you care to guess what the primary metric is that Alliance uses when awarding its executives with company stock? Unfortunately, Alliance is not alone in emphasizing non-GAAP earnings. Pfizer is another company with operating earnings that do not provide a picture as clear as you might be lead to believe. Pfizer prefers to publish "adjusted earnings" - ostensibly to ignore the impact from acquisitions - and the Street follows unquestioningly. Pfizer acquires firms every year, though, and even with the big hole in its pipeline that Pharmacia seems to fill, it seems likely that it's still going to have to acquire growth pretty consistently in the future. If part of a business' operations is consistently acquiring other firms, shouldn't that be treated as a regular expense? Kodak might also be considered a serial offender, in that constant restructurings and repeatedly closing factories over multiple years are not truly one-time expenses. Last year Kodak also adjusted its pension fund assumptions and, surprise, it happened to boost their earnings. In the telecom world, QualComm historically received a hefty percentage of its earnings from investments, as opposed to coming exclusively from the companies' operations. Those investments had not been doing too well early this year, highlighting yet another reason why investors need to pay attention to the quality of company's reported earnings. Why does this distinction matter? Because, as described eloquently here, while the market has increased by more than 50% over the last few months, the actual aggregate GAAP earnings of companies have declined by 6%. Given the gap between actual earnings and the operating earnings figures used by many market commentators, there could be unpleasant surprises in store for investors who blindly buy into the market thinking that it is cheap. It is not, and knowing the difference is critical. Q. On the Accounts Overview page in my FOLIOfn account, it shows the Tarpon Folio and also some separate cash. What is that, and is it there for a reason? A. That cash is there to basically serve as a little over two years worth of fees for both FOLIOfn and IIM. It's computed as 2% of the initial amount you invest, and I leave it separate so that we don't have to incur any tax consequences or reduce any potential growth in the portfolio. More specifically, it's there so I don’t have to sell something and increase your tax bill just so FOLIOfn and I would get paid every quarter, and/or so we can let the invested portion of the portfolio grow as much as possible without having to trim anything back just to pay fees. Ideally, every other dime in your account is invested in the market, it grows over time, there are minimal changes to the portfolio and those fees just come out of that cash for the next two years. If things become screaming cheap in the market again, there may be a time when I reduce that 2% to as low as 0.5% just to put every dime possible to work and forget about the tax impact, but we're not there these days. Having that cash is also different than a mutual fund, which doesn't keep the cash separate but instead charges you literally every day so the mutual fund company is sure to get it's take. If you've checked your account lately, you probably also noticed that inside the Tarpon Folio itself is another 10% in cash. That's a result of selling some companies, as per the discussion earlier in this letter, and I'm in the process of putting that to work. So that number will be close to 1% eventually, too, in terms of cash held inside the Tarpon Folio. With a total of 3% cash in the portfolio, that leaves more than enough for fees for a couple of years without having to sell at all - which may be idealistic, but is a useful benchmark. And some stocks we buy could come with a commission payable to FOLIOfn, too, to make the trade. We don't pay any commissions to buy/sell shares in any companies right now, but in the event we did, that's all the more reason for a little slack cash in there. The Tarpon Folio is an innovative, investor-friendly alternative to the traditional actively managed mutual fund. It's built on a model we call a Spoke Fund®. It is more transparent, takes more concentrated positions and is significantly less expensive than the vast majority of mutual funds. The portfolio is managed for long-term growth using value investing principles. See our performance disclaimer for more. The historical performance data contained above represent performance results as reported by the portfolio listed. The performance results are for illustration purposes only. Historical results are not indicative of future performance. Positive returns are not guaranteed. Individual results will vary depending on market conditions and investing may cause capital loss. The S&P 500, used for comparison purposes, is significantly less volatile than the holdings of the funds listed. The performance data is “net of all fees” reflecting the deduction of advisory fees, brokerage commissions and any other client paid expenses. The performance data includes the reinvestment of capital gains. The publication of this performance data is in no way a solicitation or offer to sell securities or investment advisory services. © 2019 Islamorada Investment Management. All rights reserved.